I had quite some fun playing forum Diplomacy some time ago here and thought I would maybe host a game of that. So for now I want to see if there is enough interest for that. 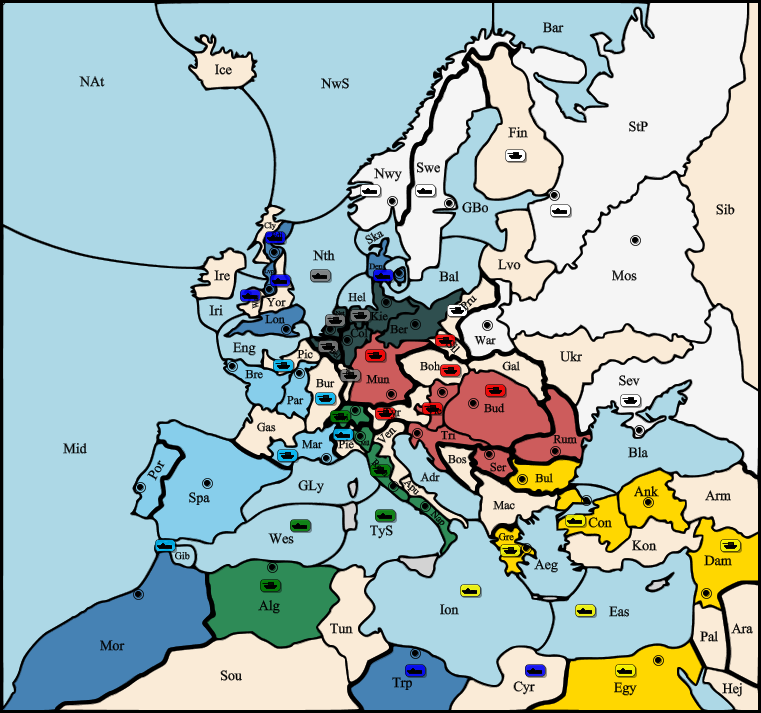 The balance of power between the seven Great Nations of Europe teeters precariously at the dawn of the 20th Century. Take control of Austria-Hungary, Britain, France, Germany, Italy, Russia, or Turkey and lead your chosen nation to victory. You will have to balance your expansion with carefully crafted alliances, knowing when to seize the advantage through a perfectly-timed stab while avoiding being stabbed yourself. To push players out of there comfort zone with the known stalemate lines and openings, we will play the 1900 variant designed to be more interactive than the original game. There are only small rule changes compared to the original version, so I think it is possible for new players to jump in. Gamers' Guide to this variant (extensive!) Discusses the motivation for the changes in a bit more detail and some ideas about the strategy in this variant. - how good or bad is the 1900 variant? - should there be deadlines, and how long should they be? Sorry, Diplomacy's just worn me down too much after my first few games. But it is great fun for at least the first time, and I encourage anybody who's never played to give it a go. As much as I love the game, Mafia is about the extent of the commitment that I can make at this time - but I hope to see this get filled and played out. I'm hypothetically interested, I love Diplomacy, but I also don't quite want to commit yet. Also might be able to drag Uncleeurope into this if I get myself together enough to want to play. I better /out for now as I might have limited access for the next ten days or so. I might re-/in after that. I'm tempted, but my experiences with Diplomacy have basically been "Wow, I am really bad at Diplomacy". Sure, include me. Once chairs and Galz cave, we got a game on our hands. I'm /in if it's happening. I'm /in. I've never played forum Diplomacy but I've played it at a table four or five times. Since it's been a while, it would probably be good if the people signed up from a few months ago could reconfirm. That's ok. Just do everything I say and our alliance will be awesome. No, you should trust me, LaLight, shraeye doesn't have your best interests at heart like I do. Okay, we heard from everyone. I'll get this set up. Any opinions on deadlines? Last game had 4-5 days roughly. I think I'll make the first one somewhat longer so people can get to know each other. Also, if anyone wants to spectate, please let me know and I can set that up.